And here's a BONUS for you - the Curvy Trio Corner Punch is 25% off as one of the weekly deals this week! It's like getting three punches for the price of one, woohoo! Small image panel: Very Vanilla 2-14" x 2-1/2"
Mat behind small image panel: Early Espresso 2-1/2" x 2-3/4"
Large image panel: Very Vanilla 3-3/4" x 5"
Card base: Early Espresso 5-1/2" x 8-1/2", scored and folded at 4-1/4"
Stamp mountains in Early Espresso to the right of the large image panel, about halfway between top and bottom, letting some of the mountain hang off the right edge of the cardstock. Stamp trees on the left side, about halfway between top and bottom, letting some of the trees hang off the left edge of the cardstock. Punch upper right with Curvy Trio punch. 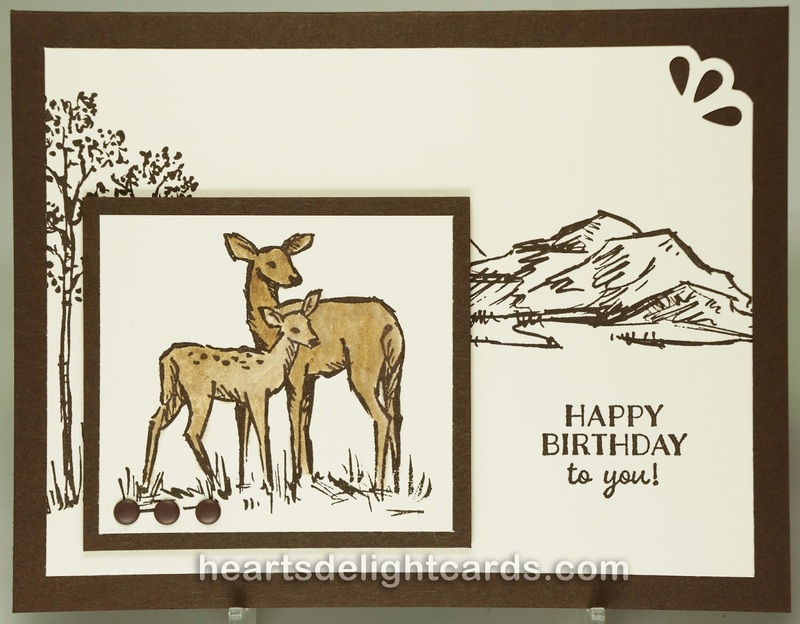 Adhere large image panel to card base. Stamp deer in Early Espresso ink on small image panel and color with a Blender Pen and Soft Suede ink. Mat on small Early Espresso mat with adhesive. Adhere small image panel and mat to left side of large image panel on card base using Stampin' Dimensionals. Add Candy Dots. Stamp birthday greeting to the right of small image panel.